Surrounding the R.W. 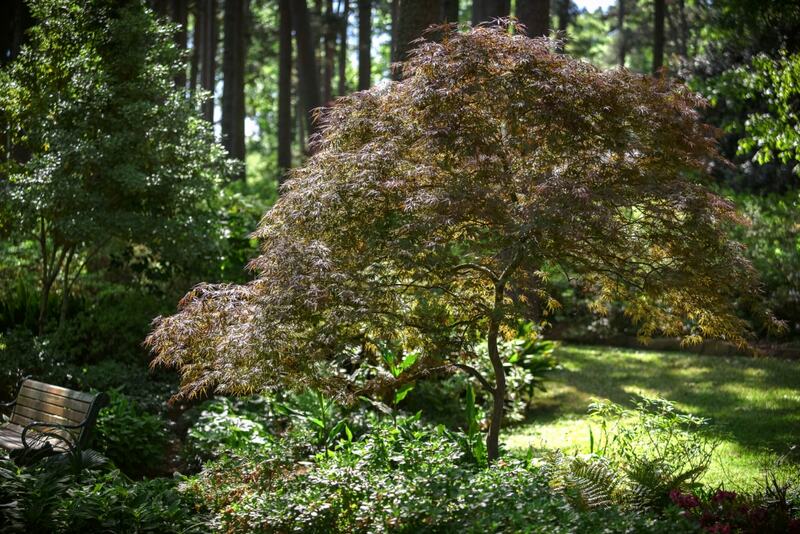 Norton Art Gallery are 40 acres of beautifully landscaped grounds and botanical gardens, where tens of thousands of plants, including several thousand of introduced and native azaleas burst forth in spring. 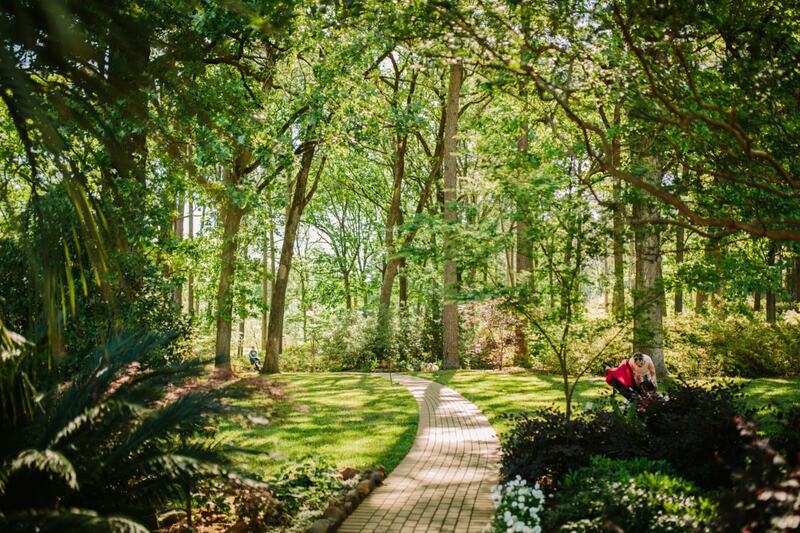 Our gardens are set among gentle swells of land, shaded by tall columns of venerable pines and oaks. Beneath them, a stream tumbles down slopes, and splashes into a reflective pond spanned by an arched bridge. Paths wind through the flowers, their meander accented with the outdoor sculptures of wildlife. Here and there, garden benches await - - perfect for resting, reading, watching birds, and listening to the breezes in the high crowns of trees. 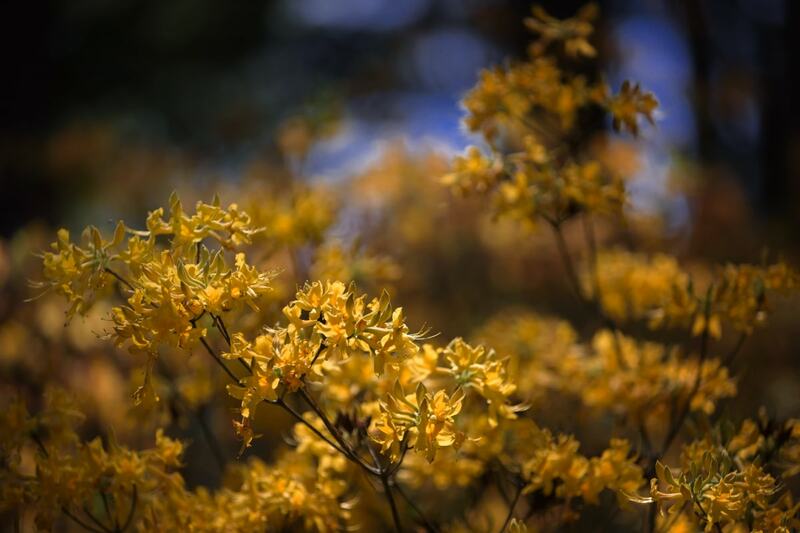 Azaleas are sometimes referred to as “the royalty of the garden” and here at the R.W. Norton Art Gallery we hold court every spring. Our beautiful and bountiful gardens contain over 15,000 plants, including approximately 100 native and hybrid varieties of azalea. These blossom into a gorgeous panoply of colors, including white, purple, pink, red, orange, yellow, and even some bi-colored blooms in the early spring, usually near the end of March or beginning of April. But even in the bleak mid-winter, they cover our hillside with a blanket of variegated green. 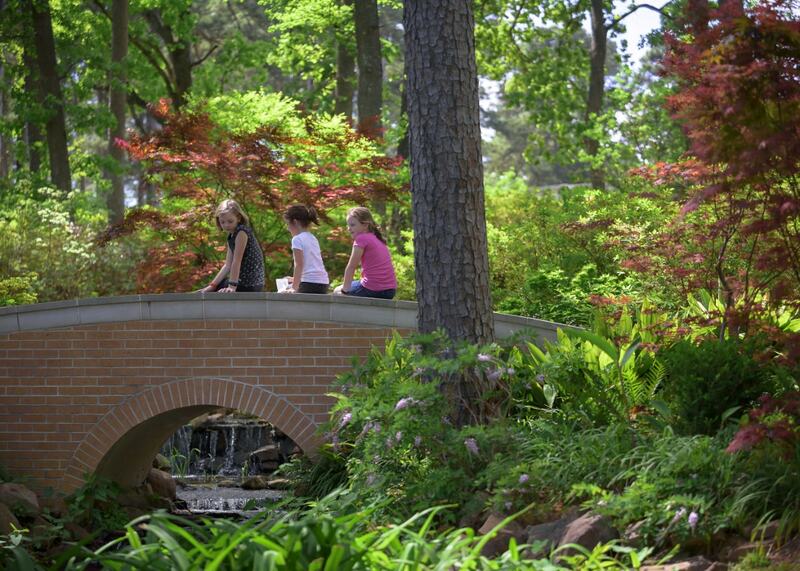 The azaleas are just one of the attractions of our 40 landscaped acres, rated as one of the South’s favorite haunts in the spring 2005 issue of Southern Living. The gently rolling terrain also includes a variety of other flowers, including the native iris, ginger lily, coneflower, canna lily, and black-eyed Susan. Underneath a canopy of majestic hardwoods and pines, several small streams tumble over rocks and waterfalls as they make their way toward the large ornamental pond at the center of our gardens. Visitors usually begin their walk at the south end of the Norton, approaching the gardens from the lush lawns and towering pines adjacent to the building itself. Entering the gardens, one should pause a moment at the wooden benches strategically placed alongside the small ornamental pool and rock garden at the top of the path. This provides a prime viewing spot from which to look down across a hillside studded with flowering shrubs, including sweet spire, dwarf abelia, and loropetalum, and lovely trees including birch, corkscrew willows, Crimson Queen maples, Bloodgood maples, dogwoods and redbuds. Our guests may then wander down along the stone path, following it back and forth over various small streams and alongside tiny ponds and pausing occasionally to take advantage of our ornamental cast iron benches to sit and enjoy the vista before them. Near the bottom, they may take the brick walk crossing over the first of our arched bridges to another section of the gardens, or continue downward to the larger arched bridge which provides two splendid views: on one side the final grouping of waterfalls as all the streams flow together with a large brown pelican by artist Sandy Scott stretching its bronze wings above the tumbling water, and on the other side, a large ornamental pond.